It is the beginning of a new year which means smaller VINTAGES releases wines with approximately 105 wines and spirits in the mix this weekend. In last week’s newsletter David Lawrason spoke about our lessened opportunities as media to cover the complete release. As we determine how we may reshape our coverage, by broadening our reporting on other outlets at which consumers can purchase wine in Ontario, you may find that a critic or two are absent from reviews. With that in mind, we have been vigilant on ensuring that at least one of us has analyzed each of the wines available in the VINTAGES release. Without further ado, herein you’ll find our top picks from the New World found on VINTAGES shelves this weekend. This week, Argentina takes center stage with a small but comprehensive feature from which we were able to pull a great deal of gems. For a thorough overview of the country’s changing landscape, don’t miss Michael Godel’s special report – A Masterclass Across Argentina. Sara d’Amato – A classic torrontés from the extreme high-altitude desert northern region of Cafayate with perfectly restrained floral character. Zesty and appealing with no shortage of freshness resulting in some visceral tension on the palate. The alcohol level is expectedly high, not uncommon for the grape variety, but it is very well integrated. A salty edge delightfully compliments the flavours of lime, sweet lemon and blossom that linger memorably. Michael Godel – Schroeder’s chardonnay is full of cool-climate personality, naturally sweet acidity and fruit out of which you can take a real, just-picked from the orchard bite. It’s chewy and yet never abandons the crisp quality that makes it so fresh and sporty. Tidy little value here. Wait until you taste the ’18. David Lawrason – Very good value from the cooler, more southerly Patagonia region – showing more structure than expected at the price. It shows fairly generous, ripe melon-peach fruit with vague bready and spicy notes – plus some vanillin. It is medium-full bodied, quite firm and even mineral edged, with very good to excellent flavour-depth. Sara d’Amato – A terrific value at under $20, this cabernet franc offers ripeness without wiping away the varietal characer. It has a distinctive note of bay leaf and cassis with savory Argentine flair. Generosly aromatic and at the same time fleshy on the palate. A widely appealing style with more freshness than expected that persists on the finish of very good length. Michael Godel – In Mendoza cabernet franc has nicely adapted to high altitudes (900m+) and its prominence began spreading after 1990, especially in Luján de Cuyo where 34 per cent of the country’s vines are grown. San Carlos is Catena’s high mountain vines exploration and their savoury, cool and spicy franc is one of Argentina’s best values in the appellative category. Fruit stands out, firm and in charge. David Lawrason – Bonarda is an Italian variety widely grown for bulk wine in the eastern, lower altitude parts of Mendoza, thus is usually treated as in a cheap, easy drinking red. This single vineyard example shows sterner and better stuff. It has a nicely expressive nose of jammy blueberry/plummy fruit with a hint of menthol and vanilla. It is medium-full bodied, dense and very smooth – almost cushy but not too sweet. The fruit depth and balance are excellent, so is the length. David Lawrason – This is a quite delicious and well-structured single vineyard malbec from the highest altitude Gualtallary Vineyard in the northern section of the Uco Valley. Very ripe dark blackberry fruit is nicely fitted with oak spice, vanilla, garrigue and excellent minerality that really shows up in the finish. It is full bodied, fairly dense yet elegant with very fine tannin structure. The length is excellent to outstanding. Michael Godel – If you were not aware of the project it is the house of Trapiche that works with and exults great growers’ fruit through their Terroir Series wines. Finca Ambrosia in Gualtallary in one of these farms that pinpoints soils and location for this particular malbec. The 2014 is ready to tell this particular story, of fruit so heady, tension so fine and the composure able to slowly render away over time. This has presence and length. Terrific malbec. Sara d’Amato – Sourced from a small southern sub-region of the Uco Valley, the La Consulta malbec-dominant blend is pine resin-laced offering terrific integration of flavors at 4 years out. Aromatic, pure and unmanipulated in style, this highly gulpable red is also quite dry with a pleasant tannic grip. Additional complexity comes via the contribution of cabernet sauvignon (27%), tempranillo (22%) and syrah (9%). A highly memorable find. Michael Godel – Two sub-appellations within the Uco Valley are employed for this cabernet sauvignon assemblage. La Consulta and Tupungato are two of the hottest spots to grow and raise the grape variety and no one know this like Zuccardi. There is plenty of verdant savour and sweet spice (namely baking) to elevate the condition and the effect this has on the senses. It’s a perfectly tidy example to educate on the merits of Mendozan cabernet. Sara d’Amato – A solid level value from Josh Cellars Paso portfolio. A relatively non-interventionist approach is evident given the purity of fruit and the subtlety of the wood spice. Dry and nicely defined with vibrancy while maintaining very good intensity. Ready to drink now. Sara d’Amato – A carefully crafted, notably sophisticated cabernet sourced from estate fruit grown throughout the Alexander Valley, the Yorkville Highlands and the McDowell Valleys. Blended with merlot, malbec and petit verdot, the flavours are complex and progressively layered. Notes of black licorice and pepper enhance the fruit while the acidity is vibrant and refreshing. Fine and subtle oak treatment along with the keenly balanced degree of alcohol make for a very drinkable style. David Lawrason – This captures the essential rather green nose of carmenere – reminding of a sappy pine cone, to which many other Canadians might also relate. But there is also blackcurrant jam fruit, pepper, some chocolate and spice. It is medium-full bodied with a loose mid-palate then some fine tannic grip. Good density. A very typical and good carmenere. Sara d’Amato – Of all of Jackson-Triggs sweet offerings at the Gala, this one drew my attention due to its wildly compelling nose of honeysuckle, peppercorn and passionfruit. Gewüztraminer can be a challenging grape to transform into Icewine due to its naturally low acidity and its propensity to weaken while overwintering out of dormancy. This version showcased delectable tartness in the face of opulent texture. Michael Godel – Finding balance with vidal for Icewine takes great care and so you know things are looking up when the first thing you notice about Marynissen’s ’13 is the fineness of its acidity. It’s just lovely, with an exemplary teaching moment on why curves matter, of a roundness that shows an obsession with the circle as the perfect form. The acidity welcomes apricot, pineapple and caramel, lifts the fruit spirit into balance and harmony. It’s an architectural Ontario temple in Greek or Roman form with vidal on its frozen altar. Finishes with a free-flow of maple syrup. Michael Godel – I recently tasted the equally excellent 2017 Vidal Gold Icewine and the logical conclusion is to award several stars to the vintage. Freezing temps early in December meant kept acidities and a crop that was picked in the same year it was raised. Expect the classic Inniskillin-Niagara Peninsula-Ontario triad of flowers, citrus and tropical fruit. Classic is the operative, longevity the conclusion. The way Icewine sipping should be. Michael Godel – There is always great expectation these days from Ontario cabernet franc and yet still a rare thing to see one walk through the magic door. Lundy’s is an 80 per cent Foxcroft meets (20) Edgerock Vineyard joint. The fruit brotherhood saw 18 months is 50 per cent new wood and the integration is seamless in a lightly touched cabernet franc. The barrel is never on your mind, or your palate. This is just exceptional work from winemakers Adam Kern and Chris Robinson. Michael Godel – Just across Kacaba’s Silver Bailey Bridge is the Silver Bridge Vineyard, planted in 1997 which incidentally is Ontario’s oldest syrah. If the significance is lost it’s surely time to pay more attention to a varietal block that has survived 20 years of extreme weather. Though it was an above average vintage the ripening was two weeks late and so phenolics were also pushed above average, lifted by 6.3 per cent viognier. Kacaba and syrah. Do you know about this relationship? You should. Early this year we lost one of our own in the Niagara wine industry, Michele Bosc of Château des Charmes Estates. The wife of Paul Bosc Jr. and mother of son Alex. Over her tenure as the winery’s VP of Marketing & Administration, Michele became the warm, benevolent face of Château des Charmes, known for her generosity, her instant amiability and ability to reach out to a vast wine community. She was forward-thinking, innovative and brought renewed enthusiasm to the brand. To call Michele dedicated is an understatement. From hospital bed to at home convalescence, she continued to have an active social media presence and an unwavering promotion of Niagara wine and Château des Charmes brands. Michele Bosc was a genuine ambassador and will be missed. On the same day, CAPS and international wine partners will be reviving the Ontario tradition of the Wine Tasting Challenge at 11AM. 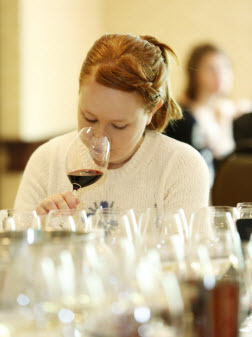 Amateurs and professionals alike will have the opportunity to compete anonymously for pride and great prizes to test their senses in a blind tasting. Three half hour sessions are available, but slots are filling up quickly. If you’d like to participate, register at the link above. Stay tuned for upcoming news reporting on wine regions both emerging and established from across the globe. Check back here this weekend for our “Only One Picks” on shelves at VINTAGES February 2nd. A waltz and a glass of wine invite an encore.